IEC 60320 C14 to C13 LOCKING Power Cords utilizing LOW SMOKE ZERO HALOGEN cordage (BSI, HAR, ROHS, IEC, HD21.14, BS EN 50525-3-11). For installation where fire, smoke emission and toxic fumes create a potential threat to life and equipment. LSZH, LS0H, LSOH, LSFH, 0HLS, OHLS. Why Low Smoke Zero Halogen? Standard power cable jackets are made from a PVC compound containing Chlorine (part of the Halogen Group), which, when burned release a toxic gas that can cause serious damage to humans and electrical equipment. This raises concerns in applications that have dense PVC cabling where electrical equipment or people are present. Low Smoke Zero Halogen, also known as Low Smoke Free of Halogen or (LSZH, LSOH, LS0H, OHLS) refers to the cable jacketing which is composed of thermoplastics/thermoset compounds that release limited smoke and no halogens when exposed to high heat/fire. This cordage was initially invented to solve two main problems: reduce smoke/improve visibility in an emergency fire escape situation and reduce toxins being released in such a fire that could harm victims exposed. This cordage is generally used where there is limited ventilation or where set standards require such health/safety measures. You can find the amount of halogen contained in typical LSZH Cable in Table 2 below. Using the table below, you can see that standard PVC cables contain vastly greater amounts halogen contents that any of the LSZH polymers. When should I use LSZH cabling? Low Smoke Zero Halogen cabling is usually used in regulated industries such as government. New data centers are sometimes choosing to use LSZH cabling to help protect data center facilities from the harmful smoke in case of fire. Because data centers utilize large ventilation systems, even a small amount of smoke in a small area can quickly be distributed accidentally throughout the entire building through the ventilation systems. A side note is the National Electrical Code requires cables used in plenum spaces to be Low Smoke Emitting, which is another common usage of this cordage. Refer to the National Electrical Code(NEC), or the National Fire Protection Agency(NFPA) to determine if LSZH cordage is right for you. The IEC 60320 C13 Locking (IEC-Lock) is a grounded 3 Wire connector rated up to 250V and 15 Amps. The C13 mates with a C14 inlet, and is commonly used in a jumper cable scenario in IT Installations providing power from a PDU to a server, router, switch or other computing device. Most people know the C13 as 'the thing that plugs into my computer' because it is the standard connector used to power most desktop computers. 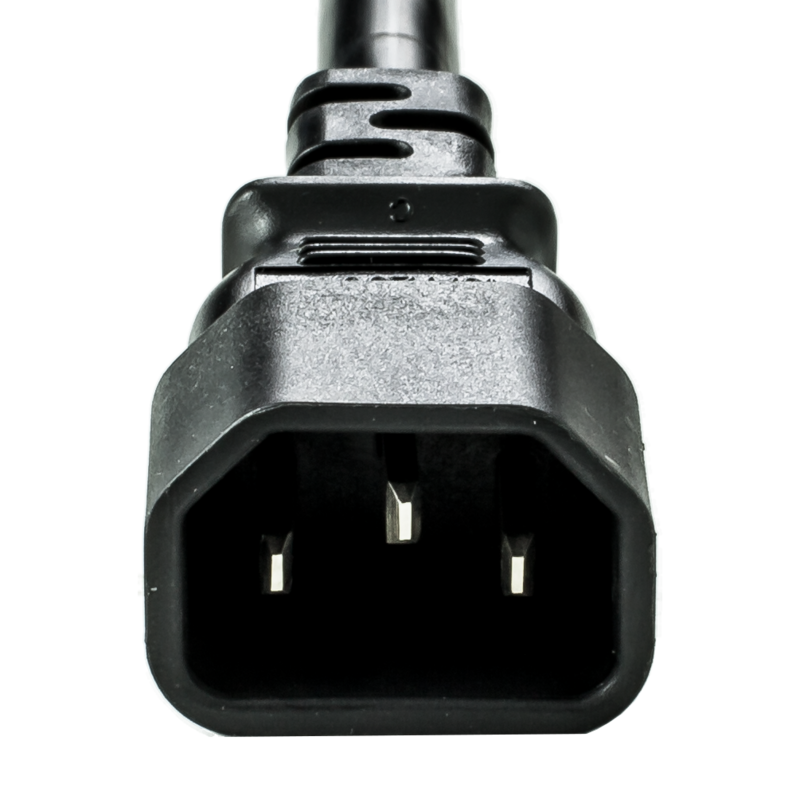 In a desktop computer application, the most common cable is the NEMA 5-15P to C13, which connects your standard North American wall outlet to a desktop computer. The locking feature on this connector is suitable for connection with any standard IEC 60320 C14 inlet, and prevent accidental disconnection.